Here’s a look at a draft of the front/back cover for The Kilim Dreaming, which should come out from Bear Star Press in California in September. Advance review copies are going out now, and if you’d like to review a copy this summer or fall, contact me. Distribution will be through Small Press Distribution of Berkeley, and of course you’ll be able to find copies in the tentacles of the giant octopus (Amazon). The book will retail for $16 ($20 Canada). Signed copies will be available through PayPal, too, with email invoicing, for approximately $2.00 more per single book: contact me here, or at rohilong[at]gmail[dot]com. 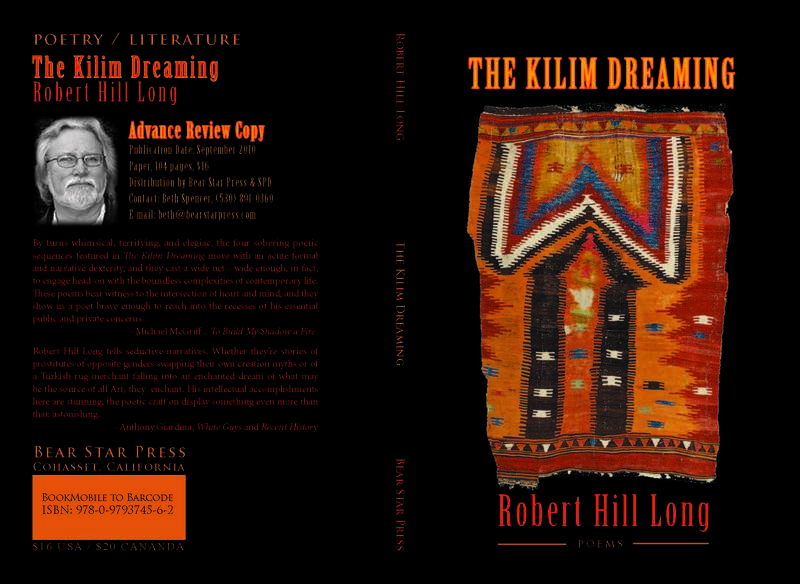 The Kilim Dreaming, slightly over 100 pages, consists of four long poems: “The Book of Joel,” “The Spear Lily,” the title poem and “An Indefinite Sentence of Exile in Florence, Massachusetts.” One of these (“The Book of Joel”) is an elegy and sonnet sequence; “The Spear Lily” and “The Kilim Dreaming” are also sonnet sequences, but are narratives about the romantic (dis)illusions found in the quest for an elusive earthly paradise. “An Indefinite Sentence of Exile in Florence, Massachusetts,” however, is in the Monty Python tradition–and now for something completely different (cue laugh track). PS: if you zoom into the cover, you can hunt for the final typo we caught before the launch of the ARCs.